With only 8 days left to go until the ballots open on Monday, February 4, 2019, openSUSE News and the Elections Committee are running a “meet your candidates” series. Questions were sent out to the seven Candidates. The questions and answers will appear in the News, one Candidate each day. You can find out more about the Elections at the Official Wiki Page. The Candidates were asked to give some biographical personal information, such as birthdate, age, their work, their openSUSE contributions, their hobby, and more, as they saw fit. Hello, I’m Marina, and I was born in Italy, in a sunny July about 35 years ago. When I was a kid, I was always curious to discover how things are made, and my sister was always the victim of my curiosity. I broke a countless number of toys due to my need to know! Apart from some justified issues with her, this passion guided me to study computer science, and, in the same period, I finally discovered the FLOSS world. Everything started around 2006 when a group of colleagues introduced me to Slackware, which shares a common history with what is nowadays openSUSE. That distro and that group of friends were the best way to learn a lot about GNU/Linux, how to properly recompile a kernel and the importance of knowledge sharing. In the same group of friends, I also found a special one who shared with me twelve years of his life. After Slackware, the group was involved with Fedora, and we started to contribute actively as Fedora Ambassadors, organizing events in schools, university, and fairs. In the same period, around 2007, I started to contribute to OpenOffice.org, mainly on localization and quality assurance. My first encounter with openSUSE was in 2009, where I had the honour to organize the Software Freedom Day 2009 in Perugia together with our group, thanks to the introduction by Andrea Florio and Mariano Iumiento. For the next four years, while I was promoting openSUSE and Fedora in parallel at various events and conferences, I was always using openSUSE as my main distribution, so I then decided to focus my main activities on that, ending my Fedora Ambassador role in November 2013. I was one of the first Italian members of the LibreOffice community. 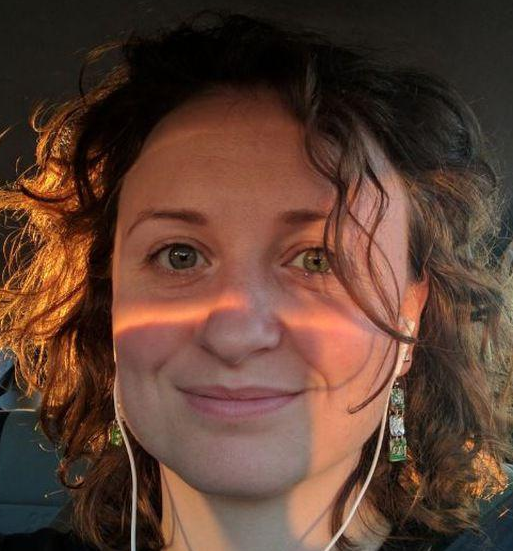 I co-founded Associazione LibreItalia, and from 2016 on I am serving as The Document Foundation’s chairperson, being involved in several events, migrations, and trainings related to LibreOffice. I worked at Studio Storti, an Italian company that provides open source solutions for Public Administrations, leading the LibreOffice Division. In June 2018, I relocated to Munich, working at CIB mainly in its LibreOffice team as Senior Migrations & Deployments Engineer. 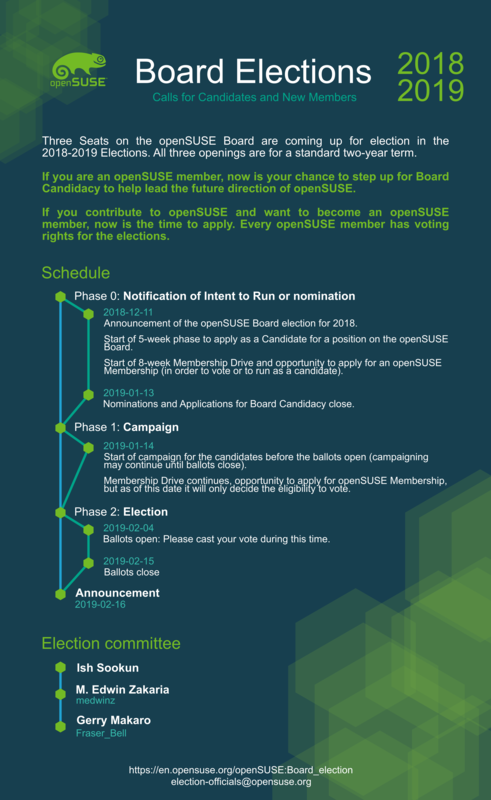 Why you are running for the openSUSE Board? I’m a proud openSUSE user and Advocate, and I finally decided to try to give something back to the Community and the Project that gave me so much until now. The openSUSE Board guides the Project and takes care of the needs of its Community. It’s that body that can make the difference. It’s the next step between a group of passionate geeks who are doing funny stuff together, and a professional group of people with a clear vision and mission that can grow a real healthy and international open source project. I strongly believe that, for having a really healthy Community, we need to start to search where are our users. Social channels are used also by new users who can become new Contributors. As I like to say with friends from other communities, we can have the best software or operating system in the world, but users need to find proper Documentation and get in touch with the local communities. One more crucial topic for growing the number of Contributors is closing the gap and improving the Communication between the main Project and the local community. We respect each other, we invest our spare time as volunteers, and need to connect what is considered a local group of Contributors or users, and the others who are part of the international community. There isn’t a unique recipe for promoting openSUSE that works in each country. Only by listening to the local communities can we improve and grow. What I would also love to do is to interact much more with other projects that are probably encountering the very same questions. The knowledge sharing is one of the key elements of the open source movement, and we should start to listen to other voices that could come also from outside the openSUSE Project, listening to what is going on around us. The mix and share of needs and ideas can foster openSUSE much more. Last, but not least, we need to invest more time in the educational sector. While interacting with the local communities, we could have the opportunity to organize more activities, for example, with universities, high schools or secondary schools for creating a large user base of Contributors. What impact would you like to make as a member of the openSUSE Board? For the past eight years, already, I have been involved in the LibreOffice community, as well as the local Italian community called LibreItalia, and for the past three years also The Document Foundation’s Board. I had the opportunity to see these groups grow, develop over time, become mature, and seeing easier and harder times, during which we’ve grown closer together. I want to bring in this experience into the openSUSE Community, help us to grow, work together jointly and at the same time keep the true Community spirit alive. Why should openSUSE members vote for you? I am proud and honoured to run for election and serve the Project that has given me so much for many years, already. If the openSUSE Members vote for me, I will bring in all my experience and do all my best to support the Community. With my background from LibreOffice and The Document Foundation, I know the duties and responsibilities of such a role, and I am willing to give my best to keep openSUSE an open, inclusive, welcoming, amazing and – most important – fun Community. What’s one thing people would find interesting about you that is not well known? Life is too short to have only one passion ,and there’s so much more than just a computer, so, besides my activities in free and open source software, I’m a mad goalkeeper and I love using my telescope to look up to the stars (which is where my nickname originates from). I’m also a music addict: When I’m not listening to the amazing, soul comforting Van Morrison, I play the accordion myself, a hobby which I started at the age of 8.